Perforating vein, Iliac compression syndrome, Left common iliac vein. Venous insufficiency is a complex condition in which the veins do not efficiently return blood from the legs to the heart. Venous insufficiency develops slowly and its complications often appear years or even decades after the onset of symptoms . Its origin is multifactorial and clinical manifestations are widely varied, ranging from dilated cutaneous veins and varicose veins, to edema, skin discoloration, and ulcers in advanced cases. The most common symptoms are pain, fatigue, heaviness, warmth and swelling of the leg, all of which are more intense when standing and under environmental conditions of heat and humidity . Venous insufficiency can affect the superficial venous system or the deep venous system, or both, but the most common situation is involvement of the superficial venous system, the main manifestation of which is varicose veins. The estimated prevalence of venous insufficiency varies depending on the criteria used. On the basis of varicose veins in the physical examination, prevalence has been estimated to range from 30% to 40% in the general adult population , and to affect up to 50% of women . If we consider the detection of reflux in the superficial venous system by hemodynamic study, prevalence can range from 9% in males to 15% in females [5,6]. Iliac compression syndrome, also known as iliac vein compression syndrome, May-Thurner syndrome and Cockett syndrome, includes a series of clinical symptoms that occur as a result of compression of the left common iliac vein between the right common iliac artery and the underlying vertebrae . There are lot of studies on iliac compression syndrome however few concern the relationship between perforating vein insufficiency and iliac compression syndrome. In this study, we would investigate the correlation among number (n), diameter (d) and blood reflux time (t) and the Left Common Iliac Vein (LICV) stenosis degree of the expansion of Perforating Veins (PVS), so as to guide the clinical formulation and adjust the treatment plan. PVs patients with LCIV in different degrees of compression in our hospital from 2010 to 2012 were collected, all patients were diagnosed by venography and clinic syndrome. A retrospective analysis of PVs patients with LCIV in different degrees of compression was done. LCIV was divided into 50-69%, 70-99%, 30-49% and occlusion of the stenosis in order to avoid the error of the left iliac vein stenosis. Pearson correlation analysis among the number, diameter and blood reflux time of PVs and LCIV were performed. All experimental procedures were approved by the Care and Usage Committee of the Hospital, and the patients’ informed consent was collected. Pearson correlation analysis among the number, diameter and blood back flow time of PVS, and the degree of stenosis was done. As shown in Figure 1 these results showed that correlation coefficients between the diameter and the degree of stenosis were rp-d=0.934. As shown in Figure 2, these results showed that correlation coefficients between the flow time and the degree of stenosis were rp-t=0.891. 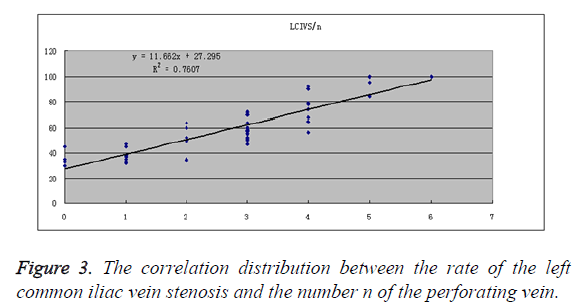 As shown in Figure 3, these results showed that correlation coefficients between the number and the degree of stenosis were rp-n=0.872. The two variables exists positive correlation and correlation was significant. Figure 1. 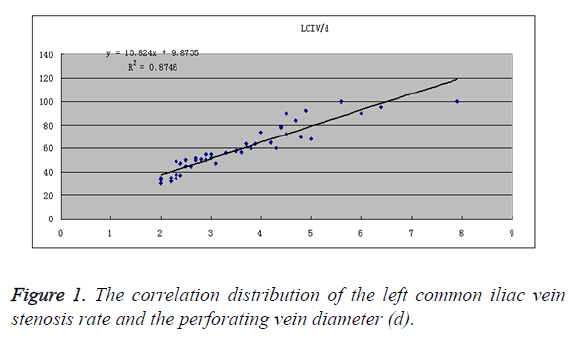 The correlation distribution of the left common iliac vein stenosis rate and the perforating vein diameter (d). Figure 2. 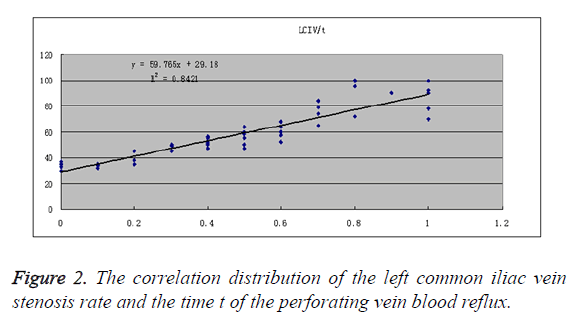 The correlation distribution of the left common iliac vein stenosis rate and the time t of the perforating vein blood reflux. Figure 3. The correlation distribution between the rate of the left common iliac vein stenosis and the number n of the perforating vein. Treatment options for venous insufficiency have advanced greatly in recent years and involve both medical and surgical methods. The choice of therapy depends on the stage of development of the disease , and options are often used in combination. Treatment of venous insufficiency in general and specific treatments for varicose veins does not cure the disease but they can prevent complications and improve signs and symptoms, even healing of ulcers in some cases. General treatment for venous insufficiency includes hygienic and postural measures (such as elevation of the legs or walking around to keep themuscle pump working) , compression therapy , topical treatment , and drug therapy . Specific treatment for varicose veins includes sclerotherapy , laser therapy , radiofrequency ablation , and surgery . In this study, we reported the correlation among number (n), diameter (d) and blood reflux time (t) and the Left Common Iliac Vein (LICV) stenosis degree of the expansion of Perforating Veins (PVS), and our data suggest that with the increase of LCIV stenosis, the number of PVs and the diameter increased, and the time of blood flow were prolonged. These results would lay the foundation for guiding the clinical formulation and adjust the treatment plan. Kurz X, Kahn SR, Abenhaim L, Clement D, Norgren L, Baccaglini U. Chronic venous disorders of the leg: epidemiology, outcomes, diagnosis and management. Summary of an evidence-based report of the VEINES task force. Venous Insufficiency Epidemiologic and Economic Studies. Int Angiol 1999; 18: 83-102. Vanhoutte PM, Corcaud S, de Montrion C. Venous disease: from pathophysiology to quality of life. Angiology 1997; 48: 559-567. Lee AJ, Evans CJ, Allan PL, Ruckley CV, Fowkes FG. Lifestyle factors and the risk of varicose veins: Edinburgh Vein Study. J Clin Epidemiol 2003; 56: 171-179. Carpentier PH, Maricq HR, Biro C, Ponçot-Makinen CO, Franco A. Prevalence, risk factors, and clinical patterns of chronic venous disorders of lower limbs: a population-based study in France. J Vasc Surg 2004; 40: 650-659. Allan PL, Bradbury AW, Evans CJ, Lee AJ, Vaughan Ruckley C. Patterns of reflux and severity of varicose veins in the general population-Edinburgh Vein Study. Eur J Vasc Endovasc Surg 2000; 20: 470-477. Bellmunt-Montoya S, Escribano JM, Dilme J, Martinez-Zapata MJ. CHIVA method for the treatment of chronic venous insufficiency (Review). Cochrane Database Syst Rev 2015; 6: 009648. Xue GH, Huang XZ, Ye M, Liang W, Zhang H, Zhang JW. Catheter-directed thrombolysis and stenting in the treatment of iliac vein compression syndrome with acute iliofemoral deep vein thrombosis: outcome and follow-up. Ann Vasc Surg 2014; 28: 957-963. Agus GB, Allegra C, Arpaia G, Botta G, Cataldi A, Gasbarro V. Guidelines for the diagnosis and treatment of chronic venous insufficiency. Int Angiol 2001; 20: 2-37. Hamdan A. Management of varicose veins and venous insufficiency. JAMA 2012; 308: 2612-2621. Nelson EA, Mani R, Thomas K, Vowden K. Intermittent pneumatic compression for treating venous leg ulcers. Cocchrane Db Syst Rev 2011; 2: 1-3. Aziz Z, Cullum NA, Flemming K. Electromagnetic therapy for treating venous leg ulcers. Cocchrane Db Syst Rev 2011; 3: 1-5. Omeara S, Al-Kurdi D, Ologun Y, Ovington LG. Antibiotics and antiseptics for venous leg ulcers. Cocchrane Db Syst Rev 2010; 1: 1-3. Tisi PV, Beverley C, Rees A. Injection sclerotherapy for varicose veins. Cochrane Database Syst Rev 2006; 1732. Flemming K, Cullum NA. Laser therapy for venous leg ulcers. Cochrane Cocchrane Db Syst Rev 1999; 1: 1182. Nesbitt C, Eifell RK, Coyne P, Badri H, Bhattacharya V, Stansby G. Endovenous ablation (radiofrequency and laser) and foam sclerotherapy versus conventional surgery for great saphenous vein varices. Cocchrane Db Syst Rev 2011; 10: 5624. Rigby KA, Palfreyman SJ, Beverley C, Michaels JA. Surgery versus sclerotherapy for the treatment of varicose veins. Cochrane Database Syst Rev 2004; 4980.